BLANCHARD, Okla. — Around the high school is farmland. It’s quiet and unassuming. You’re looking for a high school and driving on a back road thinking you’re lost until it just pops up out of the background all of a sudden, a giant cream wall with two lion logos and “Home of the Blanchard Lions” in crimson across the top. 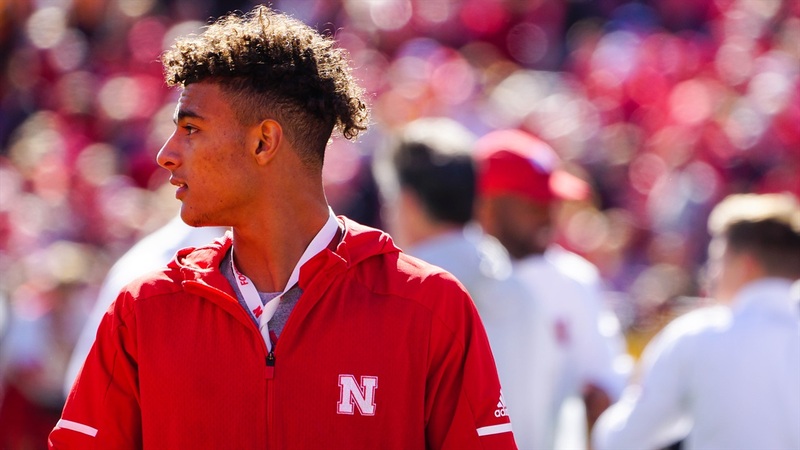 On Wednesday, Nance signed his National Letter of Intent to commit to the University of Nebraska, trading in crimson and cream for a few hues brighter. The signing ceremony was as you would expect, quiet and unassuming, especially so compared to the signings that have become the norm on ESPN and the likes. There were no TV cameras and only one other member of the media — a preps reporter from The Oklahoman. Nance was ready to sign his paperwork as quickly as possible. Finals were over and classes had ended days earlier but here was a gym full of people to see Nance off. He had as many teammates from the football team around him as possible, making sure they all got in a picture together. One leaned in and said “I feel like I’m signing, too,” to which Nance responded that they were all a part of this. Josh Raney, the team’s baseball coach was there, too, even though Nance hasn’t played an inning of high school baseball. A day earlier with Nance standing on the football field and the baseball team practicing behind it, Raney had said Nance should be playing baseball instead with a smile and a little bit of sarcastic jealousy. His family was of course there, and that included a couple of men who have trained him and become as close as possible. Nance had Travis Hartfield speak to open things, a former Oklahoma State wide receiver turned adjunct professor and fitness coach. Hartfield met Nance through a mutual friend, a friend who told him, “You’re going to want to meet this kid.” And when they did, Hartfield got his hands on some tape. Because nothing was there for a while. Nance’s first D1 offer came from Missouri but his recruitment was slow to pick up steam until a Rivals camp in April. On a field that also featured 5-star wideouts Theo Wease and Trejan Bridges, Nance shined and a slew of offers followed. TCU and Nebraska offered in April. Notre Dame and Ole Miss came in during May. The Irish saw the 6-foot two-way athlete as a defensive back. Nebraska sees him as an explosive playmaker. JD Runnels, a former Oklahoma fullback turned trainer, sees him as a Sunday wideout. The two met each other in January of 2018 after Nance reached out through Twitter. Runnels knew from Day 1 that Nance belonged in major college football. The versatility Nance possesses at receiver helps him stand out. His measurables scream of a top talent. Nance has no issues getting into a facemask and blocking when he doesn’t have the football and he’s not going to just run out of bounds to avoid contact if there are extra yards to be had. His 40 time — a 4.37 he’s very proud of — and his 10-yard burst and his change of direction are all stellar, but he can squat 400 or 500 if you give it to him. Zach Duval will have some pretty special clay to mold. Blanchard will miss that. Nance thanked anyone and everyone in the gym Wednesday. It’s clear around the town how much he means to people and yet none of it goes to his head. He’s tough on a football field and confident as ever, but he’s humble. Where other kids are on their phone during a lesson, Nance is attentive and zoned in. Nance will early enroll in January and soon after, the people of Blanchard expect Lincoln to see just why they think he’s a big deal, too.